This pattern is one I have had memorized since I was old enough to knit. I made so many of these when I was a young girl that the pattern has been etched in my brain ever since. My grandmother taught me to make these, and I guess you could say I got a little carried away. Back then, I was really into the Laura Ingals Wilder books and I even went so far as to use an old luggage box that came over with my family from Germany to make a “hope chest”. I stuffed it full of things I would need to live the pioneer lifestyle. 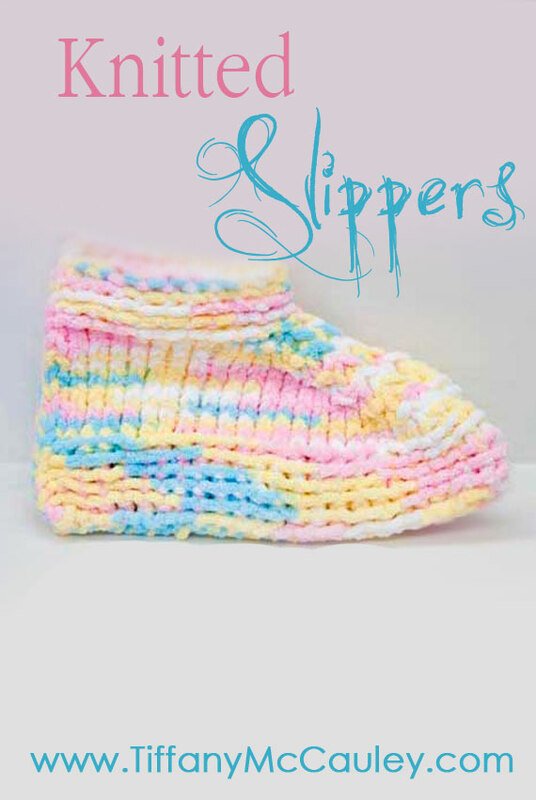 Candles, antique dishes, old school books to home school my future children and these slippers to keep our feet warm. I guess you could say I was prepping before prepping was cool. Recently, my mother who is now bedridden, was complaining about cold feet. And since Easter is just a few days away, I thought I’d knit her a few of these. This was the first time in years I had made these but the pattern came back to me as if I had knitted a pair last week. Now mind you, I’m not an expert at writing knitting patterns. So just in case there is something you can’t understand, I made a few videos to explain things as well. If there is anything you have a question on, please feel free to ask. Please note: These are very “slippy-slidey”! If you need more traction, you’ll have to sew some sort of sole onto the bottom. My cousins and I used to use these to “ice skate” up and down my grandmother’s hallway. So be warned! Pick up the 23rd stick, knit the 24th, and pull the 23rd stitch over the 24th. Pick up 1 stitch, knit 1 stitch, then pull the previous over the last. Pick up the 22nd stitch, knit the 23rd stitch, then pull the 22nd stitch over the 23rd. Knit two stitches, then repeat. Knit to end of row. Pick up the 21st stitch, knit the 22nd stitch, then pull the 21st stitch over the 22nd. Pearl two stitches, then repeat. Pearl to end of row. Continue this pattern until you have 24 stitches left on your needle. This will be the point when stitch 10 is the stitch you pick up to pull over. Knit 8 rows, finished with a loose stitch. Using a very loose stitch, cast off. Pick up the 17th stick, knit the 18th, and pull the 17th stitch over the 18th. Pick up the 16th stitch, knit the 17th stitch, then pull the 16th stitch over the 17th. Knit two stitches, then repeat. Knit to end of row. Pick up the 15th stitch, knit the 16th stitch, then pull the 15th stitch over the 16th. Pearl two stitches, then repeat. Pearl to end of row. Continue this pattern until you pick up stitch 6 to pull over. Knit 4 rows, finished with a loose stitch.